Always, Katie: A bracelet, some disclosure, and a request. A bracelet, some disclosure, and a request. I made this for myself in the waiting room while my sweet husband had his wisdom teeth taken out. Grey is the awareness ribbon color for diabetes awareness, and I have had Type I diabetes since I was 12 years old. 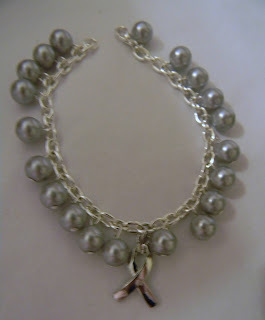 My choice of grey pearls, however, has another, kind of tongue-in-cheek, meaning. I also have polycystic ovarian syndrome, and ultrasounds of the ovaries of women with this problem often look like they are bordered by a string of pearls (actually, many small cysts). So, with this one bracelet, I get the opportunity to bring awareness to two personal medical struggles. Now for the disclosure and request: I have had a rough week. Besides some things going on with my husband's job that are disheartening, one of my cysts went crazy. It evidently grew to more than twice the size of my ovary--not nearly the largest I've heard of, but large enough--and started pressing on some stuff that caused a LOT of pain. I spent Friday in bed, crying, and we spent the evening in the emergency room (at Kettering hospital, and got AMAZING care... that's my plug). Now, I'm on pretty high-powered pain medicine while I wait to get into a doctor for follow up. Katie, I am so sorry to hear about this! I have had many many painful cysts (one the size of a grapefruit), so I understand that pain. So difficult! My sister also has PCOS, so I understand about that too. She just gave birth to her precious son, Blake who was a miracle baby too, like Trenton. We both were told it would be very hard if not impossible to concieve! Yet, we were pregnant at the same time. God doesn't understand doctors predictions, though!!! I'll be praying for you both and I hope you get to feeling better very soon! I'm SO sorry sweetie! I've been there too (exactly there actually, my doctors are in Kettering also) and I understand. I've had them get big enough to explode (or rupture, not sure what its called). It's very painful and makes you worry. But things are going to get better for you real soon. I'm praying for you and your husband both! And I'm here if you want someone to talk and or cry to! Feel better soon! i feel your pain, katie! hang in there!